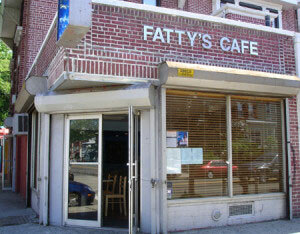 One of the reasons I hated leaving the Ditmars area for the more Astoria central 30th Avenue stop was no longer having Fatty’s Cafe just around the corner. Owner Fernando Pena dishes up tasty, healthy Cuban inspired food and drinks at his little corner restaurant. Brunches are a particular favorite, with egg dishes served up with a side of black beans, salad and a coffee or a Bloody Mary. At dinner don’t miss their amazing guacamole and chips, create your own salad (with their to-die-for house dressing), or their wide variety of burgers, pressed sandwiches, and steak creations. As a veggie, I love Fatty’s for their variety of tasty veg friendly fare too; tostones or maduros, grilled vegetable burritos, hummus plates and more! Everyday Fernando & Co. whip up a “Grilled Cheese of the Day.” Friends of mine swear by it and even call ahead to find out what’s being served that night. During weather like this, belly up to the Fatty’s bar and enjoy one of their well known Mojitos or other house libations, or just enjoy a bite in their fantastic backyard patio. When you’re done, pop over to Fatty’s Cafe’s sister wine bar Crescent and Vine.